Christmas is fast approaching us and I know christmas parties will soon be around the corner, that's why this post is perfect timing. Collection 2000 have a great range of polishes in festive colours and finishes ideal for the party season. For me an outfit includes your nails, so check out Collection 2000s 2 different ranges, and decide which one you'll be wearing to your parties this year! 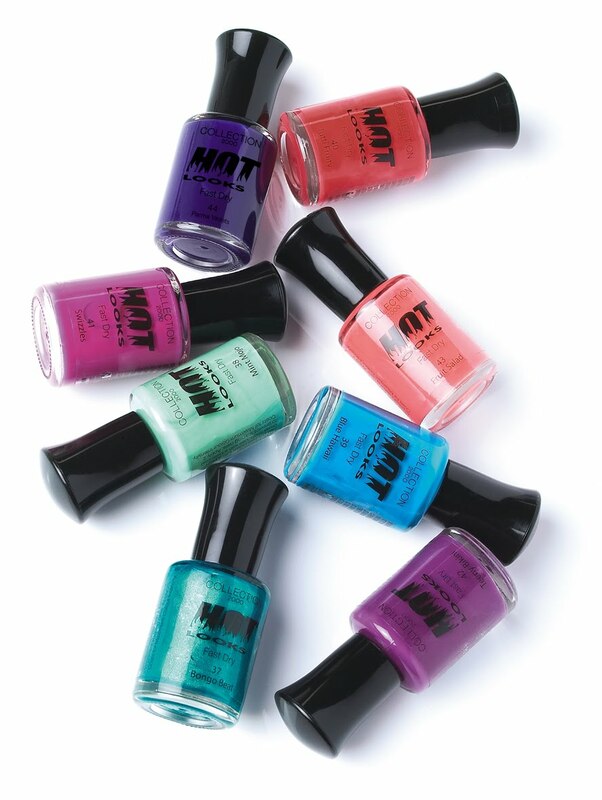 Hot looks is at the very afforable price of £1.79 (8ml) and is available in 20 shades. 'Hot Looks' polish is fast-drying and gives a high gloss finish. I have 2 new shades Minx & Parma Violets, I was very impressed with Minx. I love the red/purple undertones this gorgeous shimmer polish gives. Parma Violets is a deep cream purple and I love this on my toes with Star Dust as tips. Here I have Buried Treasure as my half moon and then minx as the main nail colour, so pretty together. I really think that the gold brings out all the pretty different coloured flecks in Minx. The other polish range they have is their 'Lasting Colour' which comes in 27 shades and costs £2.79 which is great value seeings you get 12ml of polish. I have 3 new christmassy shades, which will get you in the festive spirit once you see the swatches! I used Fire Engine & Buried Treasure together, but to be honest their indiviual colours are so pretty and pigmented you seriously just need 2 coats for maxium colour and coverage. These polishes claim to last for 10 days. Whilst I can't agree right now however I can agree that 4 days on the polish is just as good as it was when I applied it. So check back and I will upload pics to show you what they look like on the tenth day. Fire Engine which is a true red perfect for christmas. Buried Treasure is a beautiful metallic gold. Star Dust which is a stunning silver metallic shimmery fine glitter. The 'lasting Colour' polish does have a big wide brush however this did not bother me and I felt you could coat your nails with one coat almost. Have you tried any polishes from Collection 2000? They are such good value for money, I already have my eye on a few more glitzty shades! I would love to see them have a shimmery blue in their range. Love Love Love the gold and purple nail. Looks amazing! love the ruffian mani !